Double-clicking the .mdf file (the database) will automatically send the database to the "Server Explorer" window. It is out of the scope of this topic to demonstrate how to populate your Database with sample data. The attached archive contains the source code and the database file populated. Now right click on the Web project and add new "SQL to LINQ classes". Open the "Server Explorer" window and drag the database table onto the "Object Relational Designer". ("Object Relational Designer" opens automatically when you open the DataClasses1.dbml file). By default, the LINQ class is not serializable. In order to use the table in a web service, we need to make the DataClasse1.dbml file serializable. Right-click on the design surface and choose Properties from the drop-down. 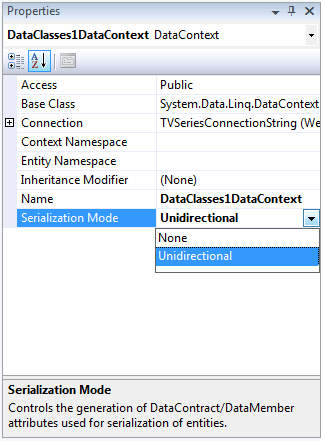 In the properties window change the "Serialization Mode" to Unidirectional. Now it's time to add the WCF service. Right click on the Web project and choose Add New Item -> "WCF service". Visual Studio adds 3 files that hold the service contract for the WCF service - IService.cs, Service.svc and a code-behind to it - Service.svc.cs. Open the first file - IService.cs. This file contains the operation contract. Change the name and the signature of the DoWork() method. You should open the Web.config file and change the binding type of the service. Make sure that your web service uses a basicHttpBinding, not the default wsHttpBinding. Scroll down until you find the system.serviceModel tag. Change the binding="wsHttpBinding" to binding="basicHttpBinding". The reason to change the binding is because Silverlight supports only basic binding (SOAP 1.1 etc.). Now you are ready to consume the service. Go to the Silverlight project and select "Add Service Reference"
Hit the discover button in the popped up window. You should use a TwoWay binding for the TimeBar's properties. This is required because of the coercing of the values that happens when a binding is executed.